PRESSURE BUILDING-UP: Don’t Be Left HANGING! Starting in six weeks, the clock begins to wind down, until the November 3rd, 2020 elections, with less two 2 years to go. Going back all the way to the beginning of this republic, the third year in office for every president, has been the most profitable one, far beyond all the years, for stock market gains. 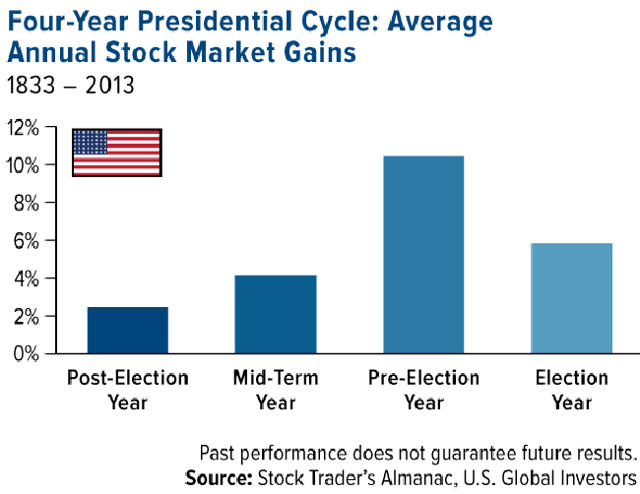 In other words, if nothing major occurs to tilt the odds this time around, investors love the pre-election year. Wealth Research Group continues to look at what we call “warning signals,” which have been prerequisites to stock market blow-off tops in the past and also for signs of a looming recession, but apart from the fact that we all know both of these are definitely coming, there are no major indicators pointing to them, at the moment. This reminds me of a Ferrari driving smoothly on the highway. The driver feels like the world is his oyster, but since he is moving at 120MPH in a 65MPH road, he is aware that at some point, he will be forced to step on the brakes because other cars are much slower, but he doesn’t see any cars ahead of him yet to indicate that braking is immediate. All of a sudden, a truck comes out of a wooded area, which was hidden behind trees and he has to press down on the brakes hard, burning his rubber tires. A recession and a stock market peak are facts of life, and until humans learn how to be more productive and more disciplined with our investments, we will be hitting the brakes at some point. Busts are unavoidable. However, the most important thing is to prepare, monitor the situation, and not stop having fun, in the meantime, because the whole idea of the markets is to build wealth, while conditions allow us to. The next recession will be met by politicians and bankers, who already feel like the public hates their guts and believes they are in bed with each other, which I see as an Achilles heel, since all parties involved will be more worried about perceptions and impression management, than with solving the actual problems. Secondly, monetary policy is all but exhausted. Interest rates cannot be slashed back to zero, nor will the Federal Reserve be excited to buy assets again. Frankly, it doesn’t need to, either. There is no excess of bad debt to the extent of 2008, anywhere. In the end, the speed of a recovery will come down to the conditions in rest of the planet, Asia mostly. This will dictate how fast the U.S. economy stops pressing the brakes and goes back to flooring it. Asia is the fastest-growing demograpphic population on the planet, both in growth and in productivity. As we come face-to-face with these recessionary pressures, we will remain flexible and make decisions, by “living” the markets. What remains true, no matter what, is that liquidity on our part is always a key component of taking advantage of downturns. There are two ways of raising cash. One is to liquidate your other assets. The other is to save more or earn more or both. Obviously, it is best to balance between these methods. If you’re looking to be as ready as ever for the next recession, (1) bite your lips, spend less, and work harder, so you can legitimately demand a raise. Think about ways to generate more business profits, and (2) look over all your positions, both winners and losers and take profits/cut losses, on whichever investments you see too much risk, compared with the rewards.